The gym my daughter frequents for gymnastics has been putting a lot of emphasis on eating after practice and also suggesting chocolate milk. I did not think chocolate milk was very healthy. Kudos to your gym for looking at the full picture of young athletes! Post workout nutrition recovery is often a neglected part of athletic training and one of the most important. After exercise, muscles act like a sponge. The glycogen (energy stores) in muscles must be replenished. After working out, muscles are in repair mode and we need to supply them with the right nutrition to help repair any damaged muscle and build muscle. This is very important to be ready and healthy (and replenished) for the next training session. A carbohydrate food with some protein is ideal for recovery (examples include: chocolate milk, mozzarella cheese stick and whole grain crackers, yogurt, 2 Tablespoons of nut butter on ½ whole grain bagel, a small handful of fruit and nut mix). Food should be consumed within 30 minutes of exercise. This may mean a packed snack for on the way home from training or practice. 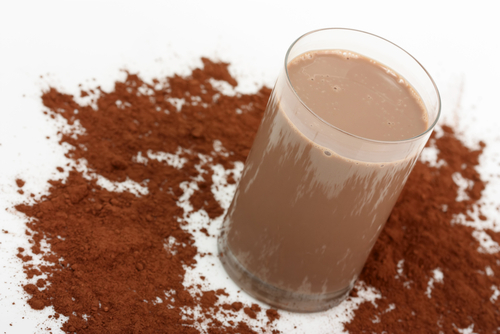 Often athletes are not hungry immediately after exercise and that is why a beverage like chocolate milk is often the preferred fuel recovery food. There have been some good studies recently in support of low-fat or fat free chocolate milk as great recovery fuel. Chocolate milk has an optimal ratio of carbohydrates to protein to help refuel tired muscles. In addition to this, flavored milk contains seven other essential nutrients that are important for an athlete’s health — including bone-building calcium. No other sports drink contains the nutrient package found in flavored milk. Chocolate milk is actually a common fuel source for many college level and elite athletes. Stay Strong – Inside & Out!